How Do You Spell TABLECLOTH? 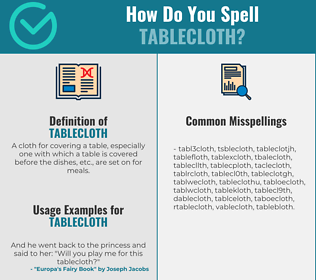 Correct spelling for the English word "tablecloth" is [t_ˈeɪ_b_əl_k_l_ˌɒ_θ], [tˈe͡ɪbə͡lklˌɒθ], [tˈe‍ɪbə‍lklˌɒθ]] (IPA phonetic alphabet). Below is the list of 221 misspellings for the word "tablecloth". A cloth for covering a table, especially one with which a table is covered before the dishes, etc., are set on for meals.